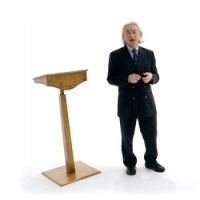 For our March meeting we took advantage of the excellent multimedia facilities at Alderminster Village Hall to show a video by the reknown theoretical physicist Dr Michio Kaku entitled "The Universe in a Nutshell: The Physics of Everything". In a very entertaining video, Dr Kaku unravels the history of physics and shares some of his own early career history. He begins by emphasizing that "physics is the foundation of technology" and how that all the equipment we come across daily in modern life is made possible through our understanding of the laws of physics. Without this foundation we would not have the use of computers nor have our health problems diagnosed by the use of hospital MRI scanners. In his younger days he was a fan of the Flash Gordon programmes but rather than focussing on the main hero he was enthralled by the white-coated physicists that appeared in many episodes. Interestingly, Dr Kaku must have had some very supportive and understanding parents. For, when he was in secondary education, he decided to build his own particle accelerator. He says he asked his mother if he could build a 2.3 million electron Volt betatron particle accelerator in their garage. She readily agreed on the proviso that he would not forget to take out the "trash". Unfortunately, this experiment took 6kW of power and when it was on it often blew all the circuit breakers in the house. But even these power outages did not bring the experiment to a halt and it brought the budding physicist to the attention of Edward Teller (of hydrogen bomb fame) who helped the young Michio gain a scholarship to Harvard. One non-fictional physicist that he holds in great esteem is the great Sir Isaac Newton who worked out the motions of the planets with his theory of gravity and his mathematical tool called calculus. Other great scientists mentioned in the video are Michael Faraday, a self-taught experimentalist who delighted Victorian audiences with his electricity demonstrations at the Royal Society. One of Faraday's more dynamic inventions is the Faraday Cage where a person stands inside a cage made of metal mesh (without touching the sides). Then bolts of electricity are generated and deliberately made to strike the sides of the cage – yet the person inside the cage is left unharmed. This is because any electric charge induced by the lightning bolt stays on the outside cage. Dr Kaku's hope for the future of modern physics is that the four forces of gravity, electromagnetism, and the weak and strong forces can be unified. He mentions the elusive Higgs boson particle (which has recently been discovered at CERN) and then more strange particles called "sparticles" which are part of a proposal called "String Theory".